The drama tells the story of Kim Joo Won (Hyun Bin), an arrogant and eccentric CEO who maintains the image of seeming perfection, and Gil Ra Im (Ha Ji Won), a poor and humble stuntwoman whose beauty and body are the object of envy amongst top actresses. Their accidental meeting, when Joo Won mistakes Ra Im for actress Park Chae Rin, marks the beginning of a tense, bickering relationship, through which Joo Won tries to hide a growing attraction to Ra Im that both confuses and disturbs him. To complicate matters further, a strange sequence of events results in them swapping bodies. 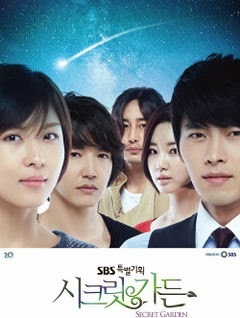 I first planned to watch Secret Garden because I watched Big Bang’s parody of it for their big 2011 comeback which really took the funniest parts of Secret Garden and made it seem like a really light-hearted drama and after seeing Big Bang portray these characters from the drama I totally had to see the original. Another reason why I planned to watch Secret Garden is that it was such a huge success when it was broadcasting in South Korea. I remember that Se7en as well as other Korean celebrities were watching it at the time and were really addicted to it, so I thought it must be good. Another reason was, of course because there was a certain someone I wanted to see act in it; Lee Jongsuk that is. After watching School 2013 early on this year, I became totally obsessed with him (lol) as I’m sure a lot of girls did after watching that drama, so I began to watch Secret Garden. Now, Secret Garden certainly isn’t what I expected it to be at all. For one, Big Bang definitely played up the whole “Freaky Friday” kind of theme a lot more than it actually featured in the 20-episode drama. However, the biggest difference from what I expected and what I actually saw from watching the drama was the depth this drama went to and the dramatic storyline. I was expecting a light hearted funny drama but instead I found a much deeper storyline. That was no relief after watching such a tear-jerking drama as School 2013 but it was amazingly clever and I can definitely say it was unlike any Korean drama I’ve ever watched. Secret Garden starts off very slow. The first four episodes just seems to drag on and while watching those I doubted why the drama had been so successful and was so famous, but I soon came to realise that even though those few episodes were slow, they were necessary to build up the back story, because this story does not just start as the drama starts, the characters story cleverly starts many years before the time the drama begins. By episode 5, that’s when the body swap happens and things hype up a lot. This is of course consequently followed by many hilarious moments and encounters like the time when Gil Ra Im (Joo Won’s body) and Oska go to the jimjilbang – I’ll leave that to your imagination. It’s that kind of humour that Secret Garden is filled with but it’s not too much so that it takes away from the seriousness of the drama. For example, Secretary Kim’s character I find absolutely hilarious. The way he’s so OTT sometimes, his affection towards Gil Ra Im’s best friend Ah Young and the way he gets jealous of his boss Joo Won in that one episode and his little temper tantrums are the cutest thing. There are two things that make this drama really stand out from the others, firstly it’s supernatural element of the body swap – although I still do not understand how or why that happened – I guess Gil Ra Im and Kim Joo Won could not have gotten so emotionally close without it being forced by something so extreme as a body swap. In the normal world, someone like Ra Im (a stunt woman) would not have so easily crossed paths and began a relationship with Joo Won (a department store CEO). This point is heavily enforced throughout the drama. The fact that they are not supposed to be together as it is so unusual and therefore unacceptable. As a writer who loves to write about forbidden and unusual love, I find this storyline comes very close to heart. That brings me on to the next point that makes this drama stand out, the entire amazingly written storyline of a man and woman that came to know each other under such tragic and unusual circumstances. Unusual because of their different levels of in social class; tragic because… you’ll see when you watch the drama (but this is what I mean of how their storylines go back many years before the drama begins. It is like Joo Won and Ra Im are star-crossed lovers, like it was meant to be that they would stir up something different in each other’s hearts. Deep, I know. But this is why this drama is so different. It’s not a cute high school romance; Secret Garden deals with death, loss, heartbreak, unrequited love and inevitability like I’ve never seen in any other drama I’ve watched (and I’ve watched quite a good amount; those for younger audiences like Dream High and Heartstrings and those for older audiences like Iris and Coffee Prince). These two characters love each other so much and do not want to let each other go despite the consequences and I’ve never seen a love more intense and inspiring in any other Korean drama I’ve watched.